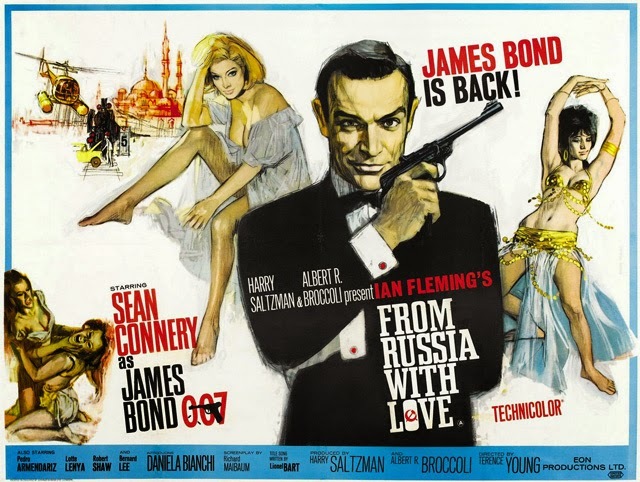 BOND: 10 Things You May Not Know About FROM RUSSIA WITH LOVE | Warped Factor - Words in the Key of Geek. Tell me, which lunatic asylum did they get Geek Dave out of? 1. President John F. Kennedy had named Ian Fleming's novel From Russia with Love among his ten favourite books of all time during an interview in Life magazine. This was amongst the deciding factors behind producers Albert R. 'Cubby' Broccoli and Harry Saltzman choosing this as the follow-up to Bond's cinematic debut in Dr. No. Once completed, a special screening was arranged for President Kennedy in the White House, taking place 5 months prior to its US general release. This was on November 20th 1963, making it the last film President Kennedy saw before his fateful trip to Dallas. 2. Peter Burton was unavailable to return as Major Boothroyd, so Desmond Llewelyn, who was a fan of the Bond comic strip published in the Daily Express, accepted the part. Llewelyn was listed simply as "Boothroyd" in the closing credits, he was not referred to by this name in any dialogue, but M does introduce him as being from Q Branch. Llewelyn returned as the character, better known as Q (for Quartermaster), in all the subsequent Bond films made (except Live And Let Die) until his death in 1999. 3. Many actresses were considered for the role of Tatiana Romanova, including Sylva Koscina, Virna Lisi, Annette Vadim, and Tania Mallet. In the end the 1960 Miss Universe runner-up Daniela Bianchi was chosen, supposedly because Sean Connery liked the look of her. 4. Bianchi started taking English classes for the role, but the producers ultimately chose to use British Shakespearean actress Barbara Jefford to dub her voice. Jefford provided additional voice work in later Bond films, dubbing Molly Peters in Thunderball and Caroline Munro in The Spy Who Loved Me. 5. Robert Shaw, who played Donald "Red" Grant, revealed that he had to stand on a wooden crate when filming with Sean Connery, as he was 6" smaller than the Scot. 6. 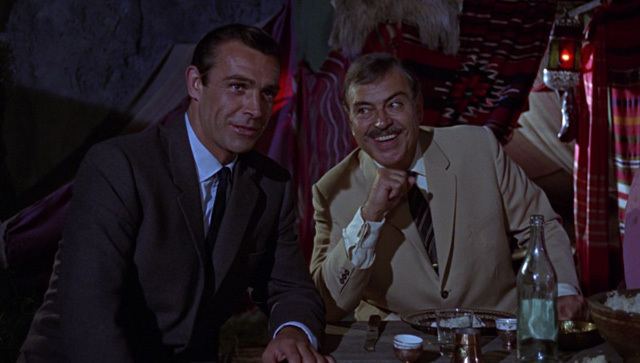 Pedro Armendáriz, who played the role of Kerim Bey, was terminally ill with cancer during the filming of From Russia With Love. He was given the diagnosis after experiencing increasing discomfort on set during location shooting in Istanbul. Overseas filming was immediately terminated, and the production moved to Britain. Armendáriz's scenes were brought forward so that he could complete them without delay. Though visibly in pain, he continued working as long as possible, but towards the end, in certain scenes, such as the Gypsy camp battle sequence, director Terence Young had to double for the actor in some of his long shots. One month after all his scenes were completed, as his cancer progressed into the advanced stages, Armendáriz committed suicide in a hospital in Los Angeles. 7. The helicopter and boat chase scenes were not in the original novel, but were added to create an action climax. Both scenes were initially to be shot in Istanbul, but when production was bought back to Britain early, new locations were sought out. On July 6th 1963, while scouting locations in Argyll, Scotland for that day's filming of the climactic boat chase, Terence Young's helicopter crashed into the water with art director Michael White and a cameraman aboard. The craft sank into 40–50 feet of water, but all escaped with minor injuries. Despite the calamity, with the production already behind-schedule and running over-budget, Young was behind the camera just hours later for the full day's shoot. 8. A video-game based on the film was released in 2005, forty-two years after the movie's release. 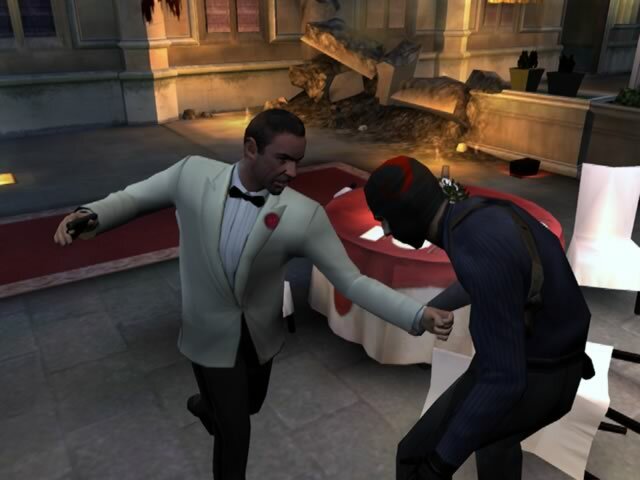 Available for the PS2, Xbox, GameCube and PSP, James Bond 007: From Russia with Love included both Sean Connery's likeness and voice, making it Connery's last performance as James Bond. 9. From Russia with Love marked the last appearance of Sylvia Trench, played by Eunice Gayson in both this film and Dr. No. The original plan was for Sylvia to appear in each film as Bond's regular girlfriend, continually frustrated when Bond is called away for his next assignment. But incoming Goldfinger director Guy Hamilton was not keen on the idea, feeling that Bond's byplay with Moneypenny should be played up more as one of the running gags in the films. 10. From Russia With Love was the final Bond movie to be viewed by creator Ian Fleming, who passed away on August 12th 1964, one month before the release of Goldfinger. 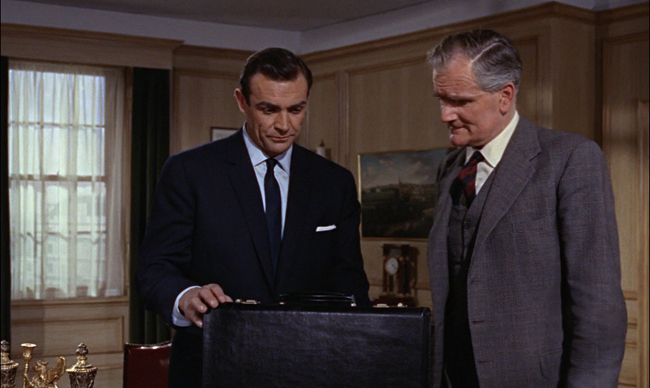 James Bond will return next Monday in 10 things you may not know about Goldfinger.